81 Commercial Real Estate and Properties in Sunshine Coast are listed in 8 categories. We have 131 Industrial Warehouses for Sale , 74 Retail Shops for Sale , 56 Offices for Sale , 53 Development Lands for Sale , 23 Hotels and Leisure for Sale and 5 Other Commercial Properties for Sale . For Sale - Perfect For Owner / Occupier Business On Busy Sugar Road $579,000 + GST (if applic..
Johns Formalwear / Allgood's Bridal are relocating and the property is now for sale or lease. Ideal for owner occupier business in this retail / office sector, looking to gain exposure along busy Sugar Road. + 210sq m (approx) consisting of 68sq m (approx) ground floor and 73sq m (approx) mezzanine + Secure basement area 69sq m (approx) that can be used as storage or to park up to four vehicles + Excellent exposure and signage with great on site customer parking + Vacant possession, current tenant is relocating + Fully air conditioned and carpeted throughout with kitchenette and amenities Call or email David Smith or Tallon Pamenter to inspect the property or to find out about other suitable options. Our team is strategically located in two offices across the Sunshine Coast region and is ready to handle your commercial, industrial and retail property needs today so call or email now. Tenanted Street Front Retail Investment Offers Above $600,000 + G..
Emily Pendleton of Ray White Commercial Northern Corridor Group is pleased to present this premise to the market for sale. The property offers the following; 37m2 Located on the ground floor within a two level, well presented and well maintained strata titled complex Positioned at the top of Buderim Ample onsite car parking The existing fit out is flexible, currently it has an open salon area, separate treatment room with kitchenette, full glass shop front and ducted air conditioning The suite is perfectly catered to someone in the beauty or allied health industries that require plumbing to treatment rooms Onsite amenities Please contact our marketing agents to discuss further or to arrange an inspection. Emily Pendleton from Ray White Commercial Northern Corridor Group is pleased to present to market the upstairs freehold of 14 Lindsay Road, Buderim being sold off the plan. The sellers have proposed plans that can be designed to suit you, this is your opportunity to stop renting and your own your own space for your business in Buderim. Situated on a 943m2 block in Buderim Located directly opposite the Post Office Buderim Central Shopping Centre The entire top floor (or part thereof) is available to purchase one option being 120m2, 153m2 or the entire floor plate for example Stylish, boutique architecturally designed building of only a small number of tenancies with character and a pleasant outlook Easy access in and out of the building including a lift allowing wheelchair access to the first floor, and excellent parking facilities. A cafe is planned to be on the ground floor for that early morning coffee client meetings It is really difficult and rare to find an opportunity like this in Buderim. For further information please contact our marketing agent Emily Pendleton on 0402 435 446. Private Waterfront Office - Full Of Natural Light $541,000 + GST (if applic..
Upper Level Maroochydore Office Suite $380,000 + GST (if applic.. Located in the heart of Beerwah's CBD area and just around the corner from the Woolworths Shopping Center these tenancies would suit a range of businesses in Retail, Medical and/or Commercial office. Floor area: 91m2 1st Level Office Exclusive Car Parking Toilet and kitchenette facilities Park and library across the road For Sale: Offers over $275,000 + GST if applicable For further information or an inspection please contact marketing agents Luca Reynolds 0422 777 074 luca.reynolds@raywhite.com Dave Tyson 0427 146 327 dave.tyson@raywhite.com Approx. First Floor, Well Presented Office On The Maroochydore Cbd Fringe | For Sale $220,000 + GST (if applic..
Emily Pendleton from Ray White Commercial Northern Corridor Group is pleased to present this affordable little office space, directly behind Sunshine Plaza in the Plaza Business Centre'. 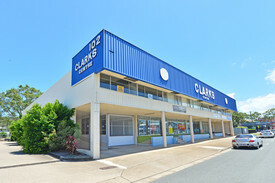 The location of this office is just superb, being close to the Maroochydore CBD but in a position that you do not have to fight the traffic and car parking like you do in Ocean Street/Duporth Avenue. 55m2 Ample natural light throughout Abundance of onsite car parks Signage opportunities available Excellent exposure to main road, complex is neighbouring the Sunshine Plaza Carpeted ducted air conditioning throughout Both lift stairwell access available Very easy access available to the Sunshine Motorway Contact our exclusive marketing agent Emily Pendleton for further information or to arrange your inspection today! Small Centrally Located Office $220,000 + GST (if applic..
+ 55sq m (approx) strata office with balcony + Open plan tenancy with good amenities + Fitout includes reception desk, three small offices with frosted glass and a kitchenette + Suitable for office or medical/allied health uses + Two secure undercover car parks + Separate visitor parking area + Close proximity to Sun Central CBD development + Easy access to town centre and motorway Call or email David C Smith or Tallon Pamenter to inspect the property or find out about other suitable options. Our team is strategically located in two offices across the Sunshine Coast region and is ready to handle your commercial, industrial and retail property needs today so call or email now. Owner Relocating - Small Corporate Office $228,000 + GST (if applic..
Tenanted by Organika, a successful long standing Noosa business, this high profile site offers security with a growing income. Prominently positioned on a busy thoroughfare road, the property is surrounded by other well known and high traffic businesses such as Harvey Norman and Jetts Fitness. Recent transactions in the street have shown the confidence that this precinct holds with investors and points towards future capital growth. The strength of this investment will attract investors so contact us urgently to discuss. + 308sq m (approx) retail showroom + Current Lease term expires 31/10/23 + Net Income $91,253 per annum plus outgoings plus GST + 3.5% fixed annual increases + Ample off street car parking + Excellent street exposure Call or email John Petralia or David Brinkley to inspect the property or find out about other suitable options. Our team is strategically located in two offices across the Sunshine Coast region and is ready to handle your commercial, industrial and retail property needs today so call or email now. Ray White Commercial Northern Corridor Group are pleased to offer 4/21 Peachester Road, Beerwah for Sale. Located adjacent to the Beerwah Village this property receives a great deal of exposure to the wider community providing you an opportunity for advertising. Features include: 190m2 retail/office 50m2 leased to 2020 to medical user 140m2 Vacancy suitable for owner occupier to occupy or investor to lease out Rear roller door access for deliveries Grease trap available Ducted air conditioning in vacancy, split system in medical tenancy Kitchenettes in each tenancy Roof top air vents which remove built up hot air from the ceiling cavity Roof top signs available 15 phone points Security system with four cameras Internal toilet amenities and wash basin room On site car parking For further information or to arrange an inspection, contact Chris Massie or Blake Primrose. Emily Pendleton of Ray White Commercial Northern Corridor Group is pleased to present Lots 2 3, 8 King Street, Buderim as a tenanted investment for sale by Expressions of Interest. The property is situated within a high profile, beautifully presented building with with strong visibility in a well established commercial precinct. 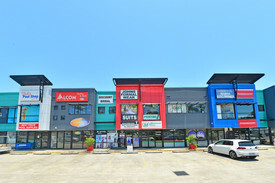 The premises forms part of the regions key retail centre with the likes of Century 21, Grant Smith Real Estate The Coffee Club with ample onsite car parking. Tenant: McGrath Real Estate Buderim Operational: 5 years in this location Lease Commencement: 8/7/2018 Lease Expiry: 7/7/2023 Option: 1 x 5 years Increases: Fixed 2% increases each year Current Net Rent: $86,718.00 Outgoings: 100% paid by the tenant This property is being sold by the way of Expressions of Interest closing on Thursday 7 February 2019 4pm. For further information or to arrange an inspection please contact Exclusive Marketing Agent Emily Pendleton on 0402 435 446. 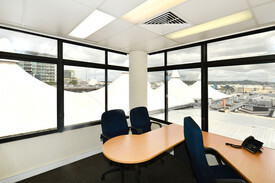 Office Suite Overlooking New Sun Central Cbd $870,000 + GST (if applic..